This book collects sketches produced for the German contribution to the 12th Architecture Biennial in Venice, including one by Alison Brooks. 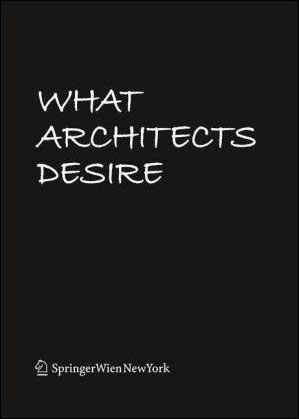 The leitmotif, desire , is at the same time the topic of a survey among architects; answers are given through drawings. What are you longing for? The response drawings are highly individual, diversity becomes programme: both in picture language and in the presentation in terms of content, reactions are quite different. But there is one thing they all have in common: the burning desire of something concrete. Sometimes it spreads lightning-like on the observer, sometimes time is required for a contemplative involvement with form and content. The architectural sketch, as it may seem, degenerated into a side product of architectural work within the last years, is back!